Duell’s Furniture Removals celebrates 40 years of service. The Duell family have a long-standing background in delivery, with Allan Duell’s great grandfather delivering goods with a horse and wagon in the city’s earliest days. The family owned and operated business had a humble beginning in 1973, when Allan would use his first truck to collect mail from the post office and deliver it to the railway station. Since then, Duell’s Furniture Removals has been servicing Mount Gambier and the surrounding districts for 40 years. Over the years, Duell’s has delivered furniture to many varied and unusual destinations, including dugouts in Coober Pedy, the 10th floor of a high-rise building and a paddlewheel steamer in Murray Bridge, with cars, boats and even aeroplanes being carried on various occasions. Offering a full packing service, Duell’s staff can not only pack up your precious and breakable items, but all of your household and personal effects as well. No matter what packing requirements you have, Duell’s can help. Duell’s Furniture Removalists Pty Ltd can supply all packing needs, including standard and book cartons, as well as specialised cartons, such as wine cartons with dividers, computer cartons, bubble wrap, white packing paper, tissue paper, packaging tape and plastic covers for mattresses, sofas, arm and dining chairs etc. Duell’s would like to thank the people of Mount Gambier and surrounding areas for their continued support and look forward to being of service to them in the future. 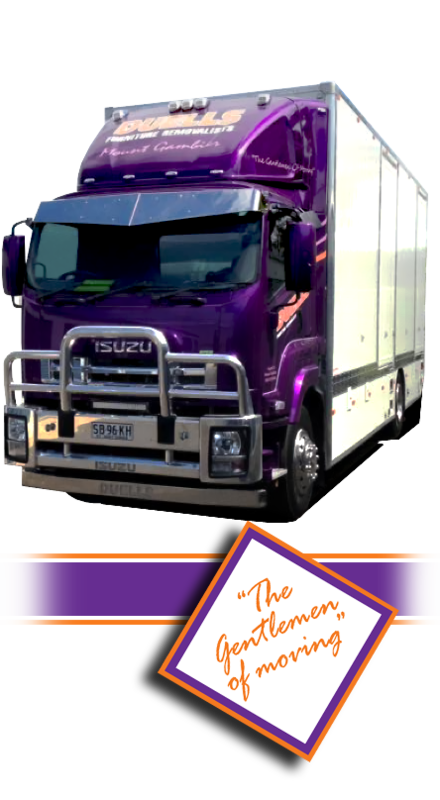 If you need to move or store your household goods, look for the blokes in the purple trucks!